Public processes frequently require review or approval – from within a department or from representatives of multiple departments. 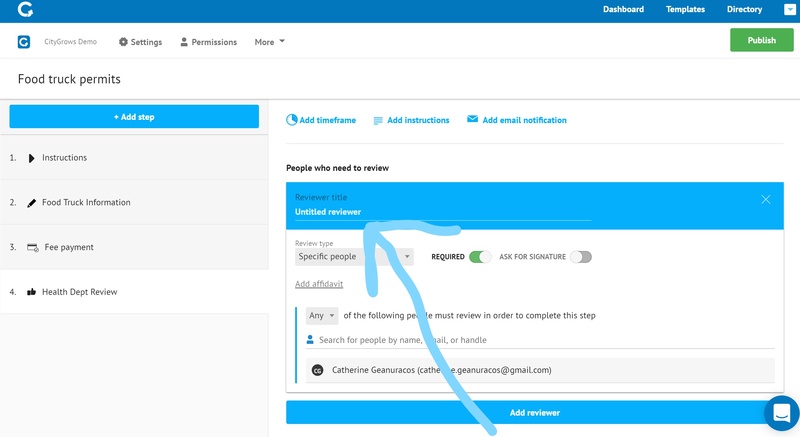 This type of step lets you indicate that a review of the application is necessary, and you must assign a specific person or group of people to do it. For example, a special event permit may need a specific person in the Parks and Rec department to review any application that includes a request for amplified sound or food sales. 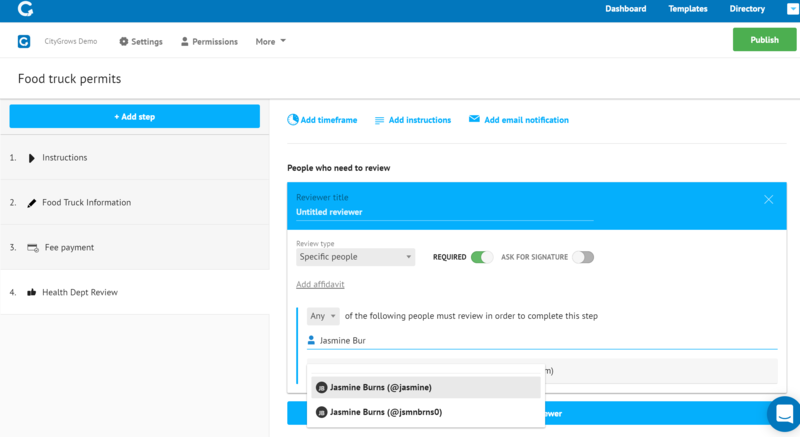 You may include multiple Review groups (often, each group is one department or business unit) in the same review step if you'd like reviews to happen simultaneously, or you can create multiple review steps if you'd like them to happen sequentially. Each review step must have at least one review group and at least one person listed as a reviewer, otherwise you won't be able to save the step or publish and use the template. Determine whether the review is required or optional. Require a signature from the reviewer using our Online signature tool (useful if you need to document for audit purposes exactly when and who approved a specific application). Determine whether "All" or "Any" of the review group must review the application. We strongly recommend having more than one staff person in each "Any" review group, so that if someone is on vacation or out sick, a process can still move forward. Some governments also choose to use group email addresses in Review steps, but we don't recommend this as it makes it difficult to tell who has actually completed the review, unless a signature is required. For more about how staffers use CityGrows to review applications once a template is published and in use, please see our guide: How to Review Applications on CityGrows. You can search for someone to add as an Reviewer by typing their name. If they're in the system already, just select their name. If they're not already in the system, you can add their email address and send them an invite. They'll be invited to create a CityGrows account and then added as a reviewer to the Template once they do. If you ever want to remove a reviewer, you access the Review step in question and click on the "X" next to the reviewer name. 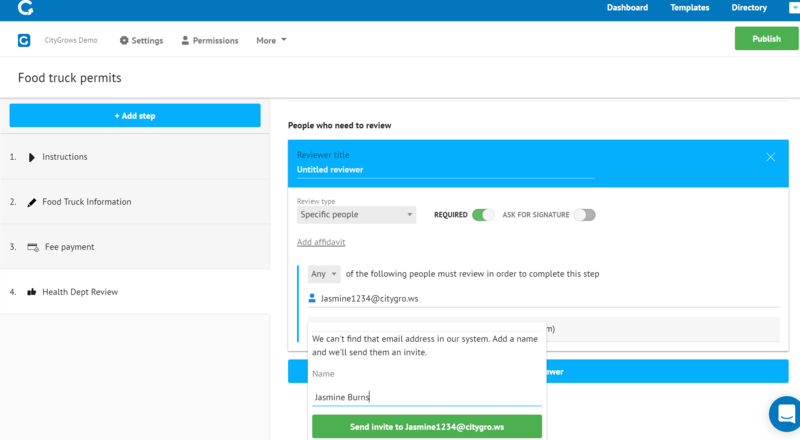 Our default settings mean that people who are Reviewers on a specific template will only receive emails from CityGrows when an application is ready for their Review. 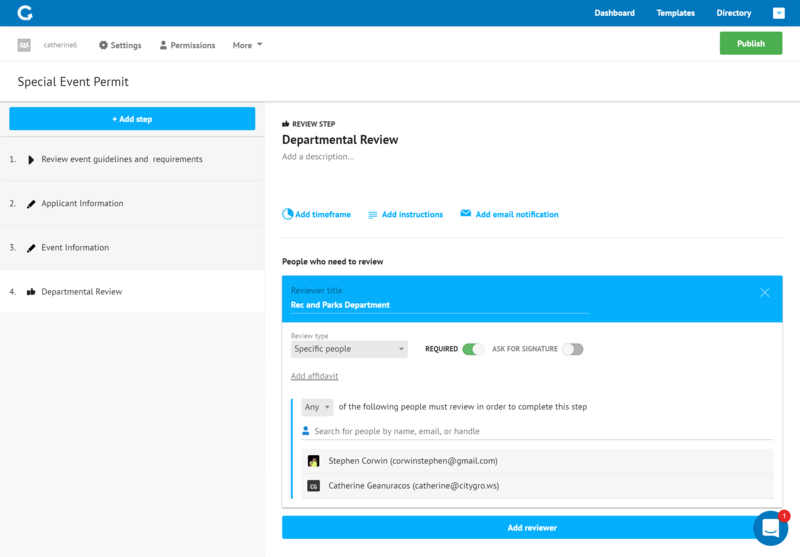 They can also see applications that are ready for their Review in their Dashboard any time. Unlike many other software companies, CityGrows doesn't put any limit on the number of reviewers a government can have in our system. We want to encourage more people in your organization to use technology, not fewer! Ready to get started bringing your processes, forms, and permits online as a CityGrows admin? Our "How CItyGrows Works" page is a great place to start.